look he was just an egg and now he is a teen!!! BIBI grew a pair of very cute ears with black fur. Product Description: many readers ask me what the new Tamagotchi has so here it is! Tamagotchi Connexions (or "Tamagotchi Plus" if you're overseas) are not simply rose-tinted re-issues. The sleek 2004 model has been updated and improved upon in almost every area. For starters, each unit features five times the computing power of earlier Tamagotchi and the larger LCD screen boasts double the resolution. More importantly, Tamagotchi Connexions can interact with fellow pets over a nifty infrared connection. This means your pets can exchange gifts, play games, 'court' each other, get married and even have babies! The level of interaction is truly impressive - if you hold two of the pets near each other, one will leap into the other screen and give flowers. Altogether now, aahh. 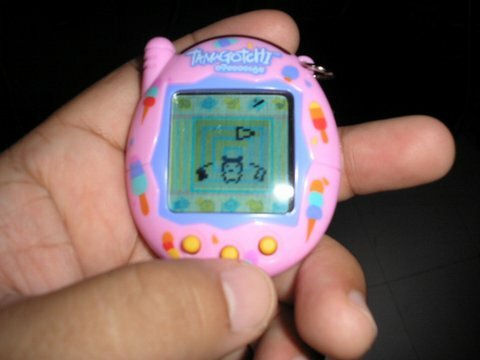 As self-appointed arbiters of what's in and what's out, it is our sworn duty to inform you that Tamagotchi Connexions are going to be the most sought after electronic gizmos since, well, original Tamagotchis. And that, dear friends, is exactly why you should get ordering immediately. Let the craze begin.